To start the “Forced Metaphor” Series, I thought I’d go for something that is really scraping the barrel and show you my new shoes. 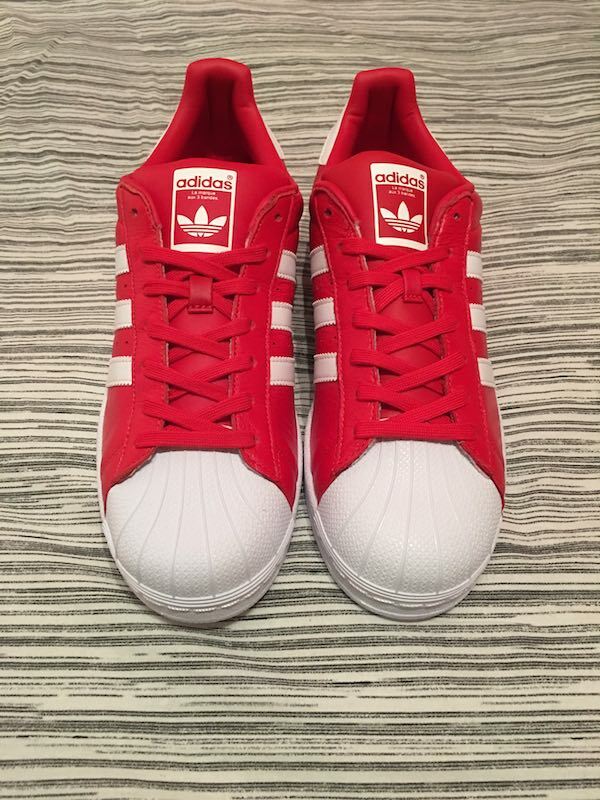 These are bright red adidas Superstars. I love Superstars and have far too many pairs, which is probably why my feet hurt when I put them in to anything else. I even have a pair that I can wear to work now we have very little dress code. Over a decade ago, I saw a pair of bright red ones. I spent so long thinking about buying them that by the time I went for it, they didn’t have any in my size. I thought I’d be able to get them again a few years later, so I wasn’t too bothered. This year, they finally came back out and I have a pair. Honestly, I’m not sure I really like them anymore but I still really, really wanted them. Yes, they’re red shoes and yes, I can think of people who will not be seen dead with me wearing them. I don’t know if I’ll even ever wear them. I’m not a fashionable person and I don’t try to be, but I can’t think of anything that red shoes will work with. Wear them with a white t-shirt and jeans and you’ll look like an American flag or Union flag, maybe. A bright red t-shirt will just bookend my trousers and I hate mismatching shades, so purple t-shirts is out too. In these, I guess the appreciation is owning them, but shoes are made for wearing and I don’t believe in not allowing something to fulfil its purpose. But these aren’t just shoes. When we’re talking of forcing a metaphor, these shoes are about not settling for something and hoping that, at some point, if you want something bad enough, it’ll come round again. I’m walking till’ the break of dawn.